Ten tall sailing ships arriving one at a time, greeted by marching bands, native dancers and thongs of Colombians on the pier at Cartagena, Colombia provided the spectacular setting for the 200th anniversary celebration of South America’s independence from Spain that began in May, 2010. 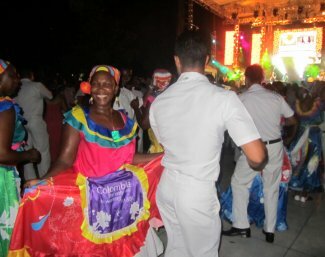 The Colombians love to celebrate and the festivities will continue throughout the year with much singing and dancing throughout the nation. Cartagena was founded in 1533 by the Spanish conquistador, Pedro de Heredia and was the first city in South America to proclaim its independence from the Spanish crown on Nov. 11, 1811. 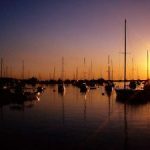 Some of the sailing ships began their journey to the bicentennial celebration from Rio de Janeiro sailing around the South American continent from Buenos Aires and Valpariso to Guayaquil, through the treacherous waters of Cape Horn and the Panama Canal making their way to Cartagena. 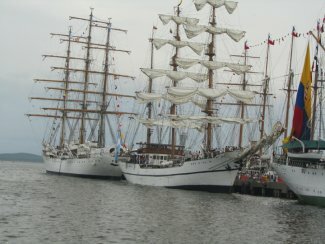 The naval crews of sailing ships from Peru, Spain, Argentina, Ecuador, Mexico, Brazil, Chile, Colombia, Uruguay made the journey. 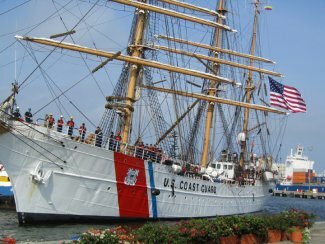 The United States Coast Guard sailing ship, the Barque Eagle also joined in the celebration making the journey from Connecticut and Puerto Rico to Cartagena. Surrounded by the Atlantic Ocean and the Caribbean Sea, Cartagena, is a UNESCO world cultural heritage city. 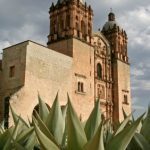 It has fortresses, castles, museums and a distinctive old walled city with Spanish colonial architecture, quaint plazas and unique shops. Cartagena also has a modern section with high-rise condominiums and five star hotels situated along its beautiful beaches. 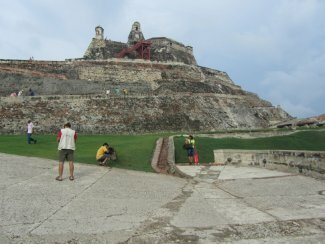 Tourist attractions include the Fort of San Felipe, built between 1636 and 1657. This masterpiece of Spanish military engineering was Spain’s biggest fort in the Americas and protected the city from pirates and attackers for several decades including the 1741 attack by the British Navy. Strolling in the Old City is a must. The walled city is flanked by a clock tower. The main door into the city crosses the famous clock tower. There is a main arch and two smaller ones lead to charming cobble-stone streets with plazas flanked by stores, restaurants and parks. 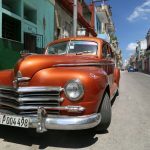 I stayed at the Monterrey Hotel in the Old City which was walking distance to the quaint stores and shops and across the street from the modern Cartagena Convention Center. The 200-year old hotel had a delightful morning breakfast with fresh fruits, eggs and pastries. 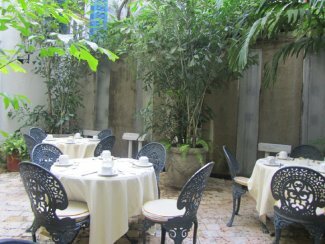 Served buffet style in an open courtyard, the breakfast is included in the daily room rate. The staff was very friendly and helpful and the guest rooms contained modern amenities, including flat screen televisions, hair dryers, separate shower and vanity areas and turn down service. Locals say a visit to Cartagena is not complete without a trip to La Popa Hill and Convent. La Popa provides the best view of the city below. On top of the hill is the old Santa Clara Chapel and the La Candelaria convent. The Church of Santo Domingo is the oldest church in Cartagena, built in the late 17th century. Open for tourists, the beautiful Baroque alter is worth the visit to the church. The Palace of the Inquisition in Cartagena offers a lesson in history for all that enter its doors. 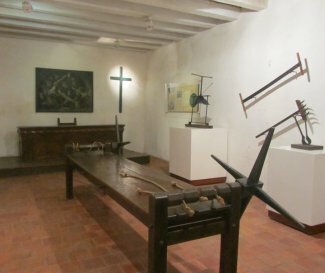 Reconstructed artifacts from the Spanish Inquisition and the methods of torture that were used for those who did not believe in the Catholic religion are displayed in this former house of torture. The Palace stands as a reminder to locals and tourists that this predominately Catholic country offers religious freedom for all of its citizens. Colombians love to eat and their diet includes a blending of Colombian, Afro-American and Spanish cultures. Rice, corn, bananas, potatoes, avocados, coconuts, plantains and mangos are the most popular fruits and vegetables that are consumed in the country along with beef, fowl and fish. Arepas are also a popular food of Colombia that are made with a variety of fillings and sold by street vendors throughout the city. Delicious desserts made from Caribbean fruits are Colombian favorites. Yucca fritters and bean fritters topped by spicy sauces are served throughout the country. The cuisine in Cartagena includes tasty freshly caught fish dishes from the surrounding seas. 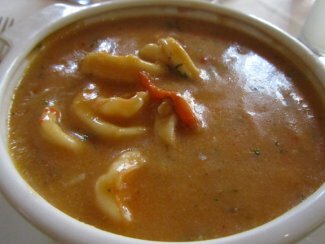 A fish soup filled with local catches of the day is a popular dish served at restaurants. 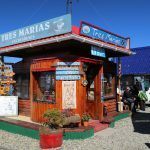 For some outstanding Colombian cuisine, try dining at Juan del Mar, El Santsimo and Porto de Santo Domingo. Picture of fish soup at Porto de Santo Domingo. 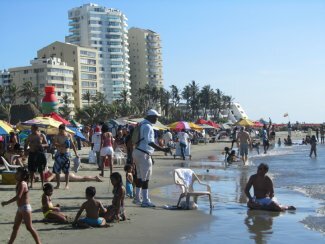 The beautiful beaches of Cartagena are always busy with locals as well as tourists. Bands play, vendors sell t-shirts and jewelry and shaded canopies protect sunbathers from the hot Caribbean sun. Be sure to bring along sun block and a hat. 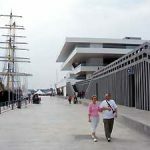 Picture of the beach area in Cartagena. 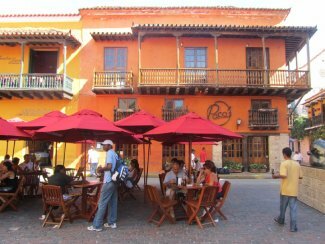 If shopping is your passion, you will find lots of it in Cartagena. Colombia is known for its high quality emeralds and there are many jewelry stores in the area. Joyeria Caribe, an emerald factory, allows visitors to take a tour and view workers fashioning raw stones into precious jewels and also has emeralds for sale. Other shopping items are handicrafts, antiques, shoes and designer clothing. Nightlife is busy and loud with dancing and singing at clubs until the wee hours of the morning. Police presence is prevalent and tourists feel safe on the streets of this busy South American city.